Well, our pigs are now pork. On April 27 we took the day off of work and with the help of some friends we killed and butchered our two pigs. It was a sad and difficult task to have to kill them, this was something neither of us had ever done before, but after a few tears we all got through it. It was a cool sunny day and we worked in the open air in our backyard. It ended up being a fun time and it was great to have many hands to help out. It took just over three hours from start to finish to break down both pigs and get all of the meat in coolers. We chilled them in eight coolers for three full days. The meat looks great and is super tender. Now we are still steadily breaking these girls down, vacuum sealing, and doing inventory. After freshening the ice daily we are down to two coolers with two giant hams and belly to go. This has been the hardest part of the task. We were prepared for the long task of breaking both girls down but we’ve been doing it in the evenings after work and it has been a big job. We quickly used up all of our freezer space and had to get another chest freezer, but it was well worth it, and I think we will get great use from this new freezer. 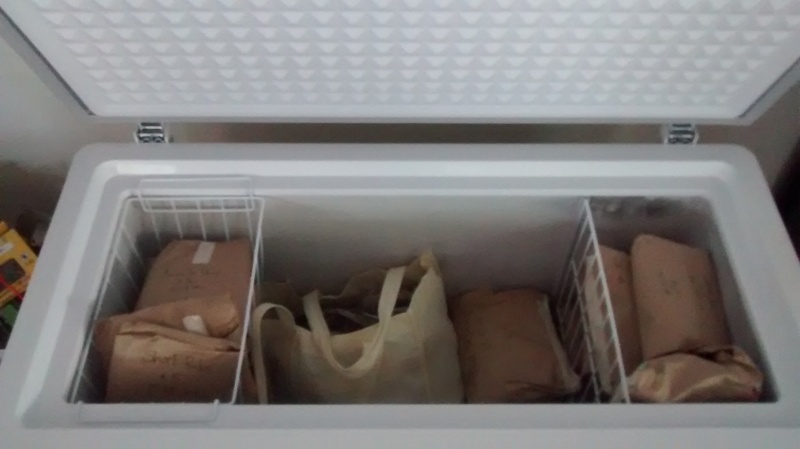 It tripled our freezer space. We also traded some eggs and pork for a smoker which will come in handy when time to make bacon and other tasty treats. We used it this weekend on some ribs and shoulders and it was delicious! Once we complete our inventory we will do an overall cost analysis, but we are looking great so far on our return. We’ve processed 200 pounds so far and are at a high estimate right now of $2 a pound for fresh, local, backyard pork. 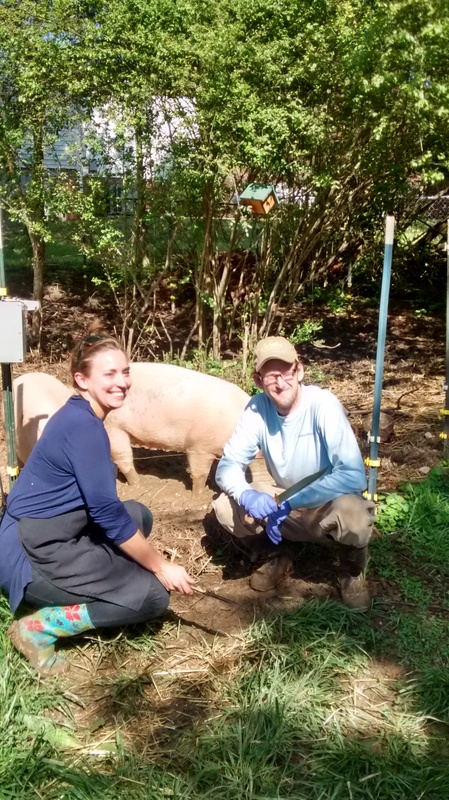 It is very quiet in the yard now and we do miss the pigs and their playful natures, but we think we will be ready to try this again in another year. We will be able to work through what we have over this year and continue bartering for other products and goodies made by friends. It will be a great year!